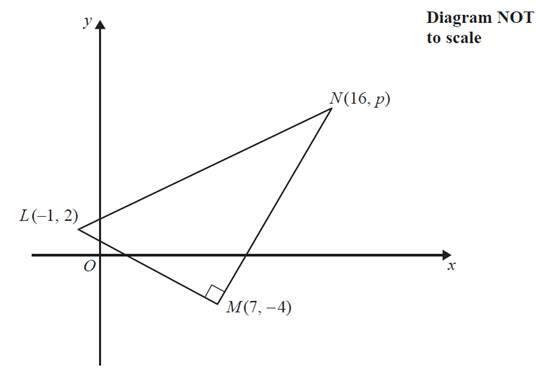 Figure 2 shows a right angled triangle LMN. The points L and M have coordinates (–1, 2) and (7, –4) respectively. a. Find an equation for the straight line passing through the points L and M. Give your answer in the form ax + by + c = 0, where a, b and c are integers. b. find the value of p.
c. find the y coordinate of K.
We are required to find equation of line passing through L(–1, 2) and M (7, –4). We have coordinates of both points L(–1, 2) and M (7, –4). We are given that lines LM and MN are perpendicular. Therefore, we need slopes of the two lines. We have coordinates of both points L(–1, 2), M (7, –4) and N(16,p). We are given that there is a point K such that the points L, M, N, and K form a rectangle. We have coordinates of both points L(–1, 2), M (7, –4), N(16,8) and K(x,y). It is evident that line KN perpendicular to MN. It is evident that line KN must be parallel to line LM. Now we have got following two equations and we can solve these to find y. We can rearrange both equations for 3x.